CONFESSORS from Australia’s first Oratory community say an increasing number of people are receiving the sacrament of penance regularly following the Year of Mercy. 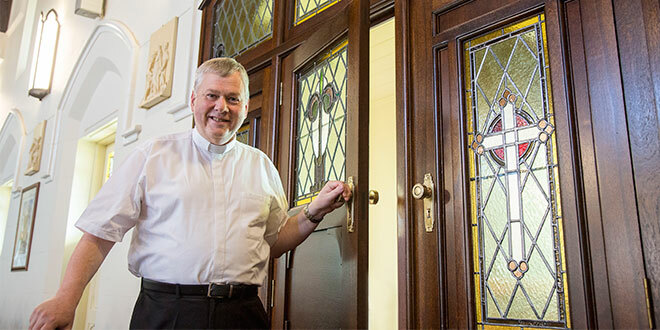 Oratory Father Andrew Wise said the original second confessional needed to be re-installed at Mary Immaculate Church, Annerley – the home of the Brisbane Oratory – to cope with the number of people lining up for confession. The church was nominated as one of seven pilgrimage sites during the extraordinary jubilee Year of Mercy held between December 8, 2015, and November 20, 2016. Pope Francis encouraged Catholics to frequent the sacrament of penance regularly during the jubilee year. The Oratory’s new confessional, which was handcrafted by Brisbane antique restorer Meade Murphy, includes pieces of the original second confessional that were found in the choir loft. Fr Wise said last year penitents were sometimes spilling over into three pews, equating to about 20 people, and an additional priest was required to hear confessions from the front pew. “It’s not appropriate to have a priest in the front pew hearing confessions while there are people kneeling nearby,” he said. The confessional is of a design that includes a partition completely separating the priest and the penitent. It was fitted into its original spot, a niche on the right side of the church, before Christmas last year. Confession in the parish is held almost daily before or after weekday Masses but increasing numbers have been approaching the sacrament following the parish’s Latin Mass on Sunday. The parish had previously experienced long confession lines on Divine Mercy Sunday last year, where Oratory Father Adrian Sharp heard confessions for almost three hours. Fr Wise said the situation was not unusual for an Oratory parish as their founder St Philip Neri was known for being a good confessor. The Italian saint was said to hear confessions “for hours and hours” and preached the spiritual value of frequenting the sacrament regularly to his congregation and fellow priests. He urged his members, which now includes three priests in Brisbane, to encourage Catholics to approach the sacrament regularly. “We spend time with people in confession encouraging them and giving them moral guidance, consolation and helpful advice in the spiritual life,” Fr Wise said. Fr Wise said people approaching the confessional regularly wanted to grow in holiness and to be more like Christ. He encouraged people to make this a resolution in the new year. “And regular confession is very much a part of that, and renewing our lives, receiving the graces of the sacrament as well as the Lord’s forgiveness, so helps us in our resolve to be more Christ-like in the new year,” Fr Wise said. Confession times at Mary Immaculate Church are available on the parish website annerleyekibinparish.com.